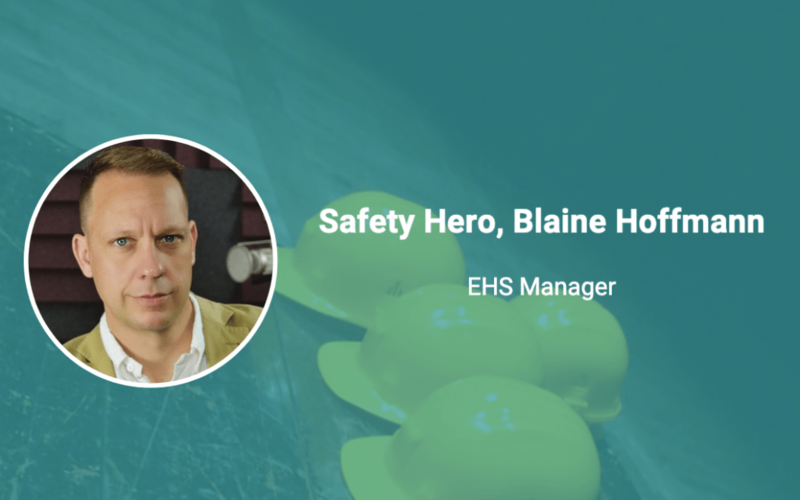 As a seasoned EHS professional, Blaine teaches businesses how to keep their employees safe. As a corporate consultant he has helped dozens of companies partner with OSHA in the Voluntary Protection Program, built sustainable safety and health management systems and worked with VPs and CEOs to elevate the EHS function to top levels of organizations. As he now works in the corporate world he continues to share his experiences and knowledge as producer and host of The SafetyPro Podcast. We asked Blaine about how he got into EHS, any insight he may have for others looking toward safety as a career and where he sees the industry heading in the future. What was your first job…and what did you learn from it? My first exposure to workplace safety was at the Fire Department through all of the training we received to help us stay safe. I was also exposed to the lack of workplace safety controls from responding to the the various workplace incidents. What I learned was that prevention, which was my area of interest at the Fire Department, was just as critical in other workplaces/industries. This got me thinking; the majority of general workplace efforts need to be around prevention. So maybe there is a job doing exactly that – helping companies prevent accidents. There are many things we learn throughout our lives and career that help shape us. One that I learned early on is to be authentic or genuine. Many professionals whom I respect have uttered some version of this. It applies in our personal lives as well as professionally. Another gem I have repeated over the years is “learn from the mistakes of others, you won’t live long enough to make them all yourself”. If we cannot learn from others, across the plant/jobsite, the business as a whole, in the industry, etc. we will continue to repeat the same incidents, injuries and illnesses. You need to develop processes that allow you to share what you learn in real-time. Also, stay active in the business community. Learning from the mistakes of others goes beyond your organization. Regardless of the industry, there are valuable lessons being learned every day elsewhere and others can learn from yours! There are a lot of things you will need to be successful in any role, not just EHS. I will talk about three. First, as I mentioned earlier, being genuine or authentic. I should expand a bit here; this is often misunderstood as a free pass to be unfiltered, blunt, even rude or unprofessional and then hiding behind the excuse that we are just being “real”. Not true. It actually comes from having achieved a high emotional quotient (EQ). This is being in touch with your emotions in real-time so that you can flex your behavior based on the situation. This gives you the ability to pick up on emotions in other people to understand what is really going on so you can manage these interactions successfully. Critical not only to your role in EHS, but in any role. EQ is also the foundation for a host of other skills you will need to be successful in general; teamwork, tolerance to change, building trust, time management, and more. According to some research, EQ is responsible for 58% of your job performance. So when someone says being authentic or genuine is a key part of success (in any role), what they are really saying is have a high EQ. Do everything you can to develop this! Second, higher education is critical. Many accredited universities now offer advanced degrees in safety management. My educational experience really helped boost my career. Many programs require a variety of courses that will help prepare you for your role. Courses like business statistics, organizational change/development, technical writing, public speaking, and more. Third is gaining the technical knowledge needed for your role. These degree programs will help you understand applicable laws, regulations, codes, ordinances, industry standards, etc. EHS needs to be treated like any other profession – invest in the education and credentials that will help you develop professionally. Quite simply: Elevate EHS to the top levels of the organization as a critical business function. It’s not 1981 anymore! Still too often EHS is mistakenly associated with other business functions simply because there may overlap in some roles, whether it is HR, Risk Management, Legal, etc. But this flawed logic seems to only be applied to EHS. We have IT handling cyber security. HR handles recruiting/retention, training/development. Legal handles patents/IP/contracts. All standing departments with leaders educated and trained in their field – it is time businesses treat EHS the same way. Then there is the perceived value the company places on environmental stewardship and protecting people when it chooses to bury EHS deep within the organization. Ideally, the EHS Leader should be analyzing trends, safety and health management systems, advising the business and helping to create corporate strategies needed to develop culture. To do this, EHS needs to be elevated as a critical business function, sitting at the same table with other business leaders. How do you see safety changing in the future? EHS does need to continue to move away from policing compliance to more of a strategic role in business. As I said, the EHS Leader should be analyzing trends, safety and health management systems, advising the business and helping to create corporate strategies needed to develop culture. It’s impossible to do this when this role has to be out on the production floor policing. Don’t get me wrong, EHS leaders should hit the floor, but not for the reasons you may think. For example, when EHS is conducting a site audit they are auditing the management of that site. EHS isn’t checking to see if housekeeping is needed for an area and getting it cleaned up, but rather that housekeeping is being maintained properly according to established company policies. Front-line supervisors are the ones that need to be reinforcing safety with workers on the floor level day-to-day. I do see EHS transitioning to support the business strategically, developing site leaders and front-line supervisors into safety coaches so that safety is seen and felt everyday by every worker – as an expectation, a part of the job. Again, this can only happen if EHS is elevated to the top levels of the organization as a critical business function. What organization or company – aside from the current one you work at – do you really admire in terms of safety and health? I really admire companies that decide to partner with OSHA in the VPP. There are less than 1400 companies participating in this program, that’s less than .25% of all US employers! It isn’t easy, it requires your safety and health management system to be among the best-of-the-best, world-class. And it starts with leadership commitment. I spent a decade as a corporate consultant helping large manufacturing companies and working with DoD agencies getting them prepared to apply for VPP and what I learned from them was that there are companies that see safety as a critical business function. I was working with COOs/CEOs that wanted to create EHS roles at the executive level of their organizations. I helped them with everything from role descriptions, interviewing external and developing internal candidates into some of these roles. I remain good friends with many of them today. What all of these leaders had in common was a fundamental understanding of the work that was needed because they had either been there themselves or took the time to get close to the work and saw the direct connection that safety had to the outputs the business desired. They all conveyed the same message: Nothing happens unless we have a safe place to work, free from the distraction of worrying about being injured, from poorly maintained equipment or uncontrolled processes. They knew that only then could they ask employees to focus on the quality of their work and only after that could they begin to achieve the desired outputs the business sought. Safety was that common denominator – that one cultural starting point upon which they built everything else. The experience I had with these business leaders is the reason I decided to leave consulting and go back to the corporate environment – to help create the same experience. What would you say are your biggest passions? I am very passionate about my profession, which is rooted in helping to keep workers safe and protect the business. I still help other companies achieve safety excellence by sharing my knowledge and experiences through a podcast I started back in 2015. The SafetyPro Podcast is about helping listeners manage safety one episode at a time – no platitudes, guru-speak or sage-talk. Just actionable information they can use right away. I figured if I want to learn from the experiences of others, maybe others want to learn from mine as well. I especially enjoy reading all of the emails I get from listeners and answering the questions they have about the challenges they also face. I get to meet some really great people that are also dedicated to helping others stay safe. Most of my LinkedIn connections today are from listeners and I correspond frequently with several professionals I have met through the podcast. I look forward to many more years of doing what I love.